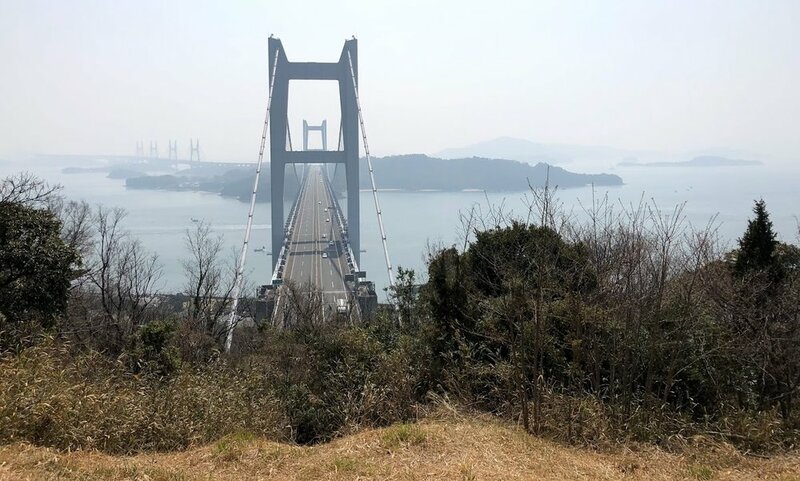 I went down to Kojima last weekend and walked with a friend from the station up to the hills in Washuzan, near the Seto Ohashi Bridge. We walked along the old train line that went from Kojima to Washuzan, which has been gone for many years. Right near the station We walked through a small shopping mall, where there was a pro wrestling match going on! It was interesting to watch for about 10 minutes. We passed the stadium where they have the Kojima Boat Races, and watched a few people practicing. They really go around the turns quickly! After about 30 minutes we finally climbed the last hill and saw the start of the bridge. The views were really nice, and we spent quite a while up there having a picnic and talking. We stayed a bit too long, though, and it started to get dark. We couldn’t find a taxi, so we ended up walking down the access road and asking a convenience store owner to call us a taxi. We got back safely in the end. It was a great day and a nice hike. Do you know any good hikes around Okayama?